The sitter in our portrait may well be Sir Thomas Drake, younger brother of the famous explorer Sir Francis Drake, as identified by a pencil inscription, ‘Sir T. Drake’, on the reverse of its former old frame. Its provenance through the Barons of Carew of Clopton, Devon, would certainly allow this, as Drake’s direct descendant, Sir Coplestone Warwick Bampfylde, 3rd Bt. (c. 1689 – 1727), married into that family. Private collection, Ireland, until 2015. Sir Thomas Drake was one of twelve children of a Protestant farmer from Devonshire, Edmund Drake of Crowdale (1518 – 1585), and his wife Mary Mylwaye (1520 – 1586). Due to religious persecution during the ‘Prayer Book Rebellion’ of 1549, the family fled Devonshire for Kent. There Edmund obtained an appointment to minister to men in the King’s Navy, and was ordained deacon and vicar of Upnor Church on the Medway. It was likely through their father’s connections that Thomas and Francis went to sea. The intriguing motif in the upper left corner depicts a vase of gilly flowers, a sparrow ‘nipping the bud’ of a gillyflower (carnation), above which is an inscription ‘fatto a tempo’, (‘done in time’, i.e., ‘just in time’). Though its exact meaning has been lost to us today, it certainly would have been understood by the sitter’s circle. 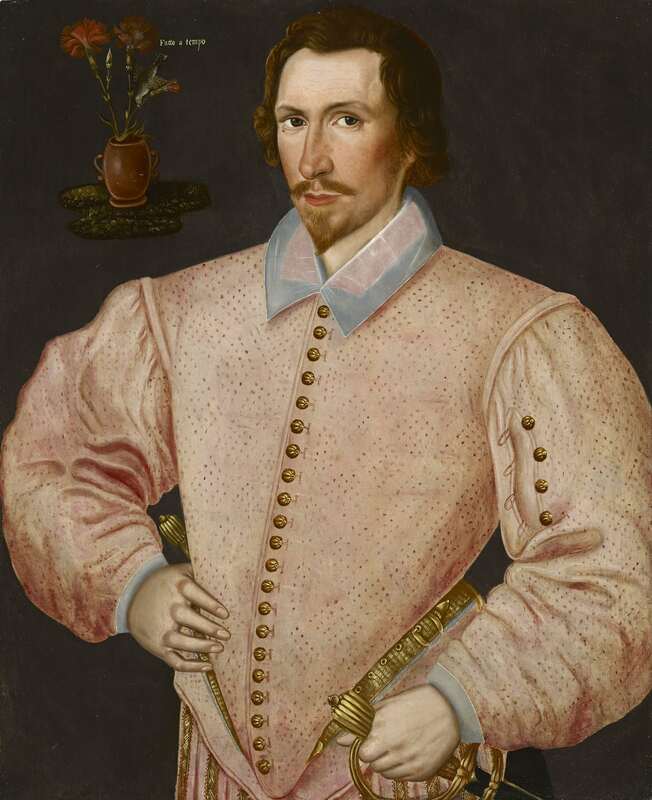 We do know that a gillyflower, or ‘July flower’, was generally used to symbolise marriage, and that Sir Thomas Drake married a widow some time between 1585 (the likely birth year of Elizabeth’s last son by her first husband), and 1588 (the birth year of Sir Thomas and Elizabeth’s first son, Sir Francis Drake, 1st Bt.). Could our portrait in some way be referencing their union? It is therefore perhaps not too fanciful to wonder whether their union was ‘just in time’. They are not the emblems of the Drake family, whose arms were Argent a Wyvern wings displayed Gules, and there is no mention of the motto ‘fatto a tempo’ in any of the contemporary printed books of mottoes both British and Continental. The choice of bird, crudely identifiable as a sparrow due to its ‘seed eating’ beak, nipping the bud of the gillyflower, is likely significant. Further supporting this dating, the artist, Hieronimo Custodis, was a protestant émigré from Antwerp who fled to England after the capture of the city by the Duke of Parma in 1585. His dated English works are from 1589 until his death in 1593. Our portrait may perhaps even have been one of his first English commissions. The simple, plain collar seen here, which replaced high, concertiaed collars and was a precursor to much larger cartwheel ruffs, was in fashion at exactly this time. They had three children – Sir Francis Drake, 1st Bt. (1588 – 1637), Elizabeth Drake later Bampfylde (1592 – 1631), and George Drake (b. circa 1593). In heraldry a ‘wyvern’ was said to represent a flying serpent, an imaginary creature resembling the dragon, but having only two legs, like an eagle's, and a barbed, serpent-like tail. ‘Argent’ refers to the tincture of silver, and ‘Gules’ to the tincture of red. Including the ravishingly beautiful portrait of Elizabeth Brydges at Woburn Abbey - see Strong, The English Icon, Elizabethan & Jacobean Portraiture, London, 1969. p.197, no.149.